Spring is the beginning of the cycling season. Kick it off by attracting shoppers to your business with an expertly crafted spring direct mailer from SmartEtailing. 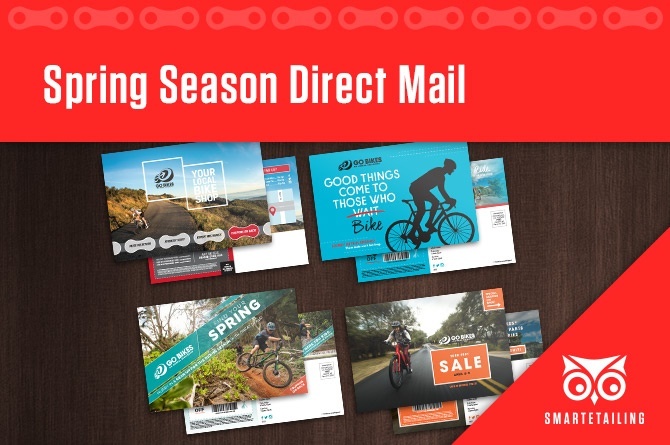 If your goal is to capture early season bike purchases, increase customers during your key spring sale dates, or attract new customers to your business – there is a direct mail tool that will help you accomplish your goals. Our system will rank and sort your mailing list to bring you the most qualified shoppers. These customers are ready to buy, which makes them a prime audience for Spring Sales and other seasonal promotions. We carefully track return on investment for each direct mail campaign. Our spring direct mail campaigns deliver an average return on investment between 100%-300%, depending on the region. Across the industry, our Deluxe 9”x6” postcards have generated average total gross sales of $32,900 per campaign. Our folding mailers see even greater success, with projects showing an average return of 393% across all campaigns (with some campaigns posting returns of over 1,000%). Consumers are ready to hop on their bike, and we want to put your business at the forefront of their minds. Capture your market’s bike service dollars and new bike/accessory purchases as people prepare for the 2018 season on their bikes. We have pre-designed mailer options to support promotions (including Trek Fest) in addition to proven customer loyalty offers to drive your best customers back to shop with you. We can offer expert advice about which tool is right for your business. Give us a call today for a free consultation and let our direct mail team find a solution for you. Orders are due by March 1st for most spring mailer efforts, so contact us right away so we have ample time to collaborate on an effective marketing campaign.